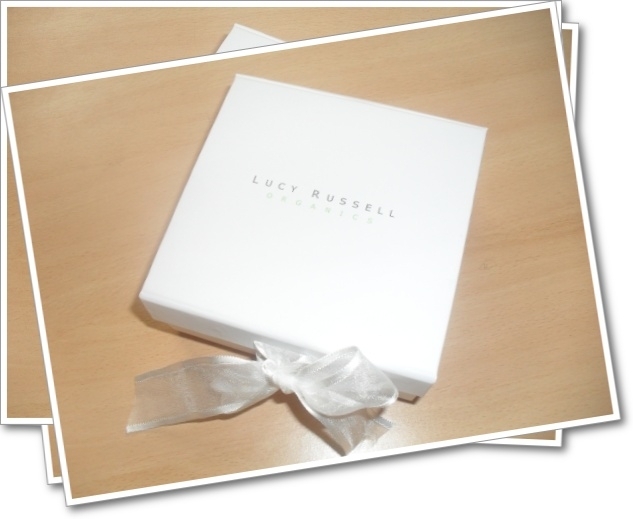 Lucy Russell Organics are the award winning brainchild of facialist and aromatherapist Lucy Russell. 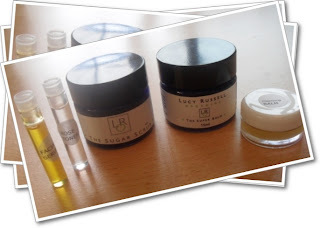 She creates organic and totally handmade skincare with ingredients sourced from all over the world. 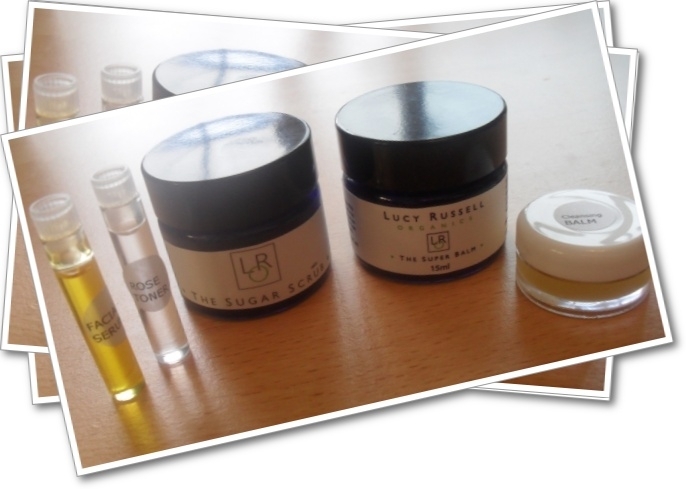 Lucy has formulated every product herself with no animal testing and by using only the finest organic ingredients she can find. Her brand ethos is all about natural and green, no chemicals, no modified ingredients, recyclable packaging - the products are all 98% organic or above and she is one of the few skin care companies to be certified by the Soil Association. So onto the products themselves - as i mentioned she has 5 products currently available, which all arrive in the gorgeous gift box below!! The serum is an oil based product which contains Rosehip seed oil, Borage oil and Candula oil and combined with essential oils such as sweet orange and Neroli flower it sounds divin even before trying it. The serum is designed for all skin types including you sensitive types and can be used as a daily moisturser, a night time fix or a facial massage oil. The serum itself is fairly thick and i did worry at first that coverege wouldnt be easy...however i was wrong..went on the skin easily..didnt leave a greasy residue or anything and sinked into the skin. It left my skin feeling lovely and soft and totally replenished. This is a delicate toner fused with Rosewater and rare organic Persian Rose essential oil. Aagain suitable for all skin types but especially for dry, sensitive and mature types. It has a lovely subtle rose scent that sent me back to being a child playing with my mums perfumes..really lovely!! The toner is cooling to apply and left my skin feeling fresh. My favourite of the lot, this is a rich cleansing balm designed to remover make up and balance dry and oily skin. It contains Jojoba seed oil, candual flower oil and coconut oil along with the yummy essential oils of lemon, orange and May Chang. The balm comes in a solid state which on contact with the skin melts in and releases a smell of lemons. Coverage was easy and if removed using a muslin cloth (which they also sell) - the muslin helps to polish the skin and remove impurities leaving behind totally clean and refreshed skin. I was completely surprised by this product...my skin felt amazingly soft..so much so i didnt feel the need to use moisturiser. Iv fallen in love with these super balms ever since i reviewed 'All for Eves' version a while back..and again this one does not disappoint. The balm is designed for multi purpose use so you can use on your face, feet, nails, hands, lips...basically anywhere that needs a little bit of nourishing TLC. This balm contains a multitude of flower oils from Rosehip seed oil to Roman Chamomile Flower oil. Again it comes in a solid state...and a little goes a long way so a small pot will last you ages.It provides a fast instant fix to dry skin - you can even use this stuff on split ends!! Iv used this for dry skin on my face and feet...and it works wonders.....this little pot will last me ages - if you havent yet discovered Super Balm give it a go...tis fabulous!! The super scrub is designed for all over body use. It contains a blend of brown sugar, coconut oil and cocoa and shea butters. Now i find with some scrubs they only contain a small amount of scrubbing bits and generally turn out quite disappointing - this you can literally see from looking at it is packed with ample scrubbing properties - the scrub is thick and very grainy, i felt perhaps a little too thick but it did cover well...It has quite a strong lemony fragrance which i wasn't overly keen on but the best thing about this product is the feeling of your skin after - zingy clean and soft....again no need for moisturiser!! fantastic!! 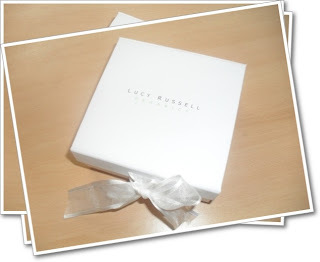 Lucy Russell has produced a fantastic little range of products here and its great to know exactly what your putting on your skin.... ie no nasties just natural ingredients!! The pricing is at the higher end of the scale, however when you realise how much work goes into these products you can thoroughly understand the pricing point - the products scream quality, and with the gorgeous packaging would make an ideal gift. I love the fact that everything is handmade and not created in a lab - its like your getting a little bit of Lucy with every product. Great post! The products seem very interesting and i love how they're so personally made and organic! For that price its something i'd personally want to try before i buy though!